After a three week hiatus tonight a whole new episode of ABC’s hit series Once Upon A Time airs called ‘The Return.’ The last time we saw the show it was finally revealed why the Evil Queen loathes Snow White. It seems Snow White caused Regina to betrothe royalty and she ended up living a regal – but loveless – life. Meanwhile Emma continued her exhaustive search for evidence that would prove Mary Margaret’s innocence in the murder of David’s wife, Kathryn. If you missed the episode you can read our full and detailed recap here. On tonight’s show Mr. Gold attempts to uncover the true identity of August, Emma confronts Regina about her involvement in Kathryn’s disappearance, and David tries to apologize and reconcile with Mary Margaret. Meanwhile, in the fairytale land that was, Rumplestiltskin agrees to comply and do whatever it takes if his son can find a way for him to safely give up his powers and turn back into the loving man he used to be. We are getting close to the finale of the show – ABC announced the official finale date for the show, and it’s Sunday, May 13, 2012. The official title for the finale episode is said to be ‘A Land Without Magic.’ If we are to believe the promo we have seen for the final episode Regina recevies her comeuppance and Regina will be decapitated by Emma. I cannot wait to see the episode! August is with Henry and they’re trying to come up with a way to make Emma believe. Henry goes in to visit Mr. Gold at the Paw shop. Henry tells Mr. Gold he wants to get a gift for Mary Margaret because she didn’t kill David’s wife. Meanwhile August goes into the back room of Mr. Gold store while Henry is distracting him. Mr. Gold comes over and sees August and asked if he can help him. August claims he’s looking for maps, Mr. Gold says the maps are in the shop not in my office. At the hospital Emma is visiting Kathryn, she asks Kathryn if she remembers what happened. Kathryn claims she does not remember much after the car went off the road. Kathryn is surprised that while she was away everyone thought she was dead. Emma tells her that a heart was found matching her DNA. Regina meets with Mr. Gold and she accuses him of breaking the deal .Regina is mad because she felt Mr. Gold promised to kill Kathryn. Mr. Gold says I did not promise the killer I promise that something tragic would happened to her. Regina is upset because this will raise all kinds of questions about where Catherine was and why the lab results were faked. Regina realizes it will all lead to her. Regina asks Mr. Gold why he did this – he was the one who created the curse to put this town the way it is. She asks Mr. Gold why he did it. He tells her to figure it out your highness. In the fairytale Rumpelstiltskin son was almost hit by a cart. When the man realizes whom he almost hit he becomes frightens-Rumpelstiltskin comes out and his son tells him he was not hurt. Rumpelstiltskin notices a cut on his son’s leg and he looks at the man who hit him with the cart and turns them into a snail. His son yells no. But Rumpelstiltskin steps on the snail and crushes it. Killing the man. David is visiting Kathryn the hospital-he apologizes to her, he apologizes he lied to her. She tells him it’s okay. She cannot blame him for being the first person who saw it. He tells her she is kind of amazing! They are having a welcome home party for Mary Margaret. Henry asks August how hard it was to get caught by Mr. Gold in his office. Emma tells Henry they have to take him home before Regina his mother notices. Emma opens the door and there is – Emma tells him Mary Margaret is a bit tired and it’s going to take time. She tells David to drive Henry home. Emma asks Mr. Gold if he made Kathryn materialize. Mr. Gold asks Emma what she knows about August. Emma tells Mr. Gold he is a writer. Mr. Gold asks if she trusts August and she responds yes, more than she trusts Mr. Gold. In the fairytale Rumpelstiltskin son is upset because he killed the man. 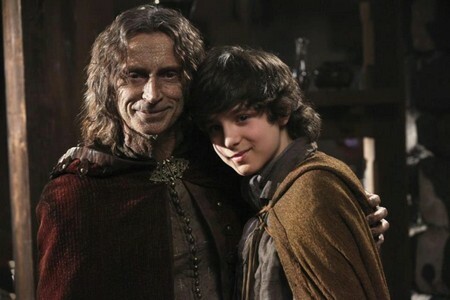 Rumpelstiltskin wants to heal his son but he doesn’t want him to. He doesn’t want magic. He tells his father he is different now, he hurts people all the time. He tells his son he saved everyone in the ogres war, he led the children home. Rumpelstiltskin shows his son a knife with his name on it and tells his son if someone kills him with the knife it will kill him. His son wants his father back. Rumpelstiltskin tells him if he finds a way to remove the power without killing him he will do it. Mr. Gold is breaking into August’s room. He finds August’s typewriter and near it is a pile of papers he goes through the papers and finds a picture of the knife with Rumpelstiltskin name marked on it that could kill him. Emma comes into the diner and meets with Sydney and she sits down with him and tells him she knows he bugged her office. She tells Sydney either help her or help Regina if he helps Regina he’s going down with Regina. In the fairytale children are playing and Rumpelstiltskin and his son walked by-he tells his son to go play with the other children. As his son approaches the children they run away, they are frightened. A girl comes up to speak to his son and he tells her to go away. She tells him she’s not afraid of his father she remembers how his father save them during the Ogre war. Rumpelstiltskin asks his son why the children went and he tells him the children were frightened of him. He realizes when he sees blood on his father’s boots that he killed their Maid because she saw the knife that could kill him. August is leaving the Nun’s house. Mr. Gold comes up to mother superior and she tells Mr. Gold her rent is paid up and wants to know what he wants. He threatens the nun -he wants to know who August is. Mother superior tells Mr. Gold August is looking for his father who he had a difficult parting from and they still have many issues to resolve. In the fairytale Rumpelstiltskin son is going to visit the Blue fairy to get her to help him. The fairy tells him there is something dark in his life-he tells her it is his father. She tells him she cannot make his father like he was before-but she can send him somewhere where he won’t be able to use his magic. She tells him the only way that he can get his father back is if they leave. He opens his hand and she gives him a magic bean. She tells him to follow would the bean wisely and it will save them both. So now we know Rumpelstiltskin’s son is Jack and the Beanstalk. Mary Margaret is walking and David comes up to her- he wants to talk to her. He wants to apologize because he did not believe her or standby her when she was accused of murder. She tells him she’ll never forget what he did. She expected him to stand by her even though the rest of the world didn’t. Mary Margaret tells him something in this world does not want them together. David tells her he loves her and she responds and that’s what makes it so sad. Rumpelstiltskin’s son tells them he found the way to save him. He asks his father if he ever heard of the blue fairy? He tells his father they have to go to a place where there’s no magic, Rumpelstiltskin says he would be weak if he went to a place like that. His son reminds him that he made a deal with him – he asks if he is going back on the deal. Rumpelstiltskin says NO. Mr. Gold is knocking on the local psychiatrist ,Dr. Hopper’s door. He asked Mr. Gold if he wants to talk. Mr. Gold tells him that he thinks he may have seen his son, but he may just be seeing what he wants to see. Mr. Gold thinks his son may still be very angry. Mr. Hopper tells Mr. Gold that anger between a child and a parent is the most natural thing. Mr. Gold tells him he thinks the son is here to kill him. Dr. Hopper tells them to just be honest with him. Mr. Gold walks up to August and tells him knows who he is and he knows what he’s looking for. August says I guess all the lying can stop, Papa! Yikes! In the fairytale Rumpelstiltskin asks his son what kind of world are they are going to that has no magic. His son drops the bean on the ground and a hole opens up, he takes his father’s hand and tries to get them to jump in the hole but Rumpelstiltskin is nervous-he tells his son he cannot do it. He holds his son’s hand and keeps screaming he cannot!! He is frightened! He lets his son hand go and his son falls down the hole and the hole vanishes. He screams his son’s name-but it is too late he is gone. He screams,”I want to come with you”, but it’s too late. Mr. Gold tells his Son that he was right, he was a coward and he should never have let him go. He tells his son that ever since he left he has spent every waking moment trying to find. Mr. Gold begs August to forgive him and apologizes. He starts to sob and August embraces him. August tells his father he forgives him. Mr. Gold comments that his son was looking for the knife. August tells his father if Mr. Gold had the knife he would know his father did not change. He tells his son he had to hide the knife so Regina did not find it. He gives his son the knife and tells him to destroy it. August says the knife is remarkable he points at Mr. Gold and says “ by the power of the darkness I command you dark one.” Mr. Gold realizes August is trying to control him and that he realizes August is not his son. Mr. Gold tells August that he knows he is not his son because his son would’ve known that the knife would not work in this world. Mr. Gold tells August it is time to starts answering questions .Mr. Gold wants to know how he knows about his life. Mr. Gold realizes that August is from his world. Mr. Gold wants to know who told him about him and his knife. August responds a little fairy. Mr. Gold tells Augsut since he knows who Mr. Gold he is he knows his chances of him surviving this encounter are pretty slim. August tells him he will die anyways-he tells Mr. Gold he is sick and he is going to die. August asks him if he’s going to let him live and Mr. Gold says – you’re going to die anyway so maybe I’ll get something out of it. Rumpelstiltskin is calling for the blue fairy-he wants to know how he can follow his son. She tells him he had a chance and did not take it and there are no more magic beans. The blue fairy tells him it cannot be done without a great price he tells the blue fairy that she took his son and he will get him back. The blue fairy tells him he drove his son away. Emma comes into her office and Regina is waiting. Regina congratulate her and tells her they’re about to be a big break in her case. She tells Emma she’s about to hear a confession. She calls Sydney in – Sydney says it was him-he abducted Kathryn and held her in the basement. He took the heart and he doctored the DNA results. He was also the one who planted the knife. Emma does not buy it. He tells Emma to go to the basement of the house and she will find lots of fingerprints and will then know he is telling the truth. Regina tells Emma she cannot see what is right in front of her. Emma asks Regina to go out to the corridor and she tells Regina that Sydney’s confession is the biggest load of crap she ever heard. Emma tells Regina she’s sure she is behind it. Emma tells Regina she doesn’t care what happens to her and she doesn’t care what happens to Regina but she does care about her son. She tells Regina to stay away from her son. She tells Regina that she tried to takes away something Emma loved and now she’s going to take away something Regina loves. Emma is taking back her son Henry back.